Shipments of protected African species including tortoises, pythons and parrots to Asia have soared since 2006 as demand grows in the Far East for exotic pets, meats and other animal products, a new study warned Tuesday. Wildlife imports of leopard tortoises, African spurred tortoises and ball pythons into Asia increased nearly tenfold in a decade, the report by monitoring network Traffic said, while trade in animal skins including seals also rose. Although much of the trade is legal, all of the species in the study are protected under the Convention on International Trade in Endangered Species (CITES). “Until now the legal wildlife trade between Africa and Asia has been largely overlooked,” said Willow Outhwaite, co-author of the Eastward Bound study, adding that the report aims to “fill in some of the blanks in our understanding of this vast, complex” trade. Using import and export databases, the report found more than 1.3 million live animals and plants, 1.5 million skins and 2,000 tonnes of meat from CITES-listed species have been exported from Africa to East and Southeast Asia since 2006. 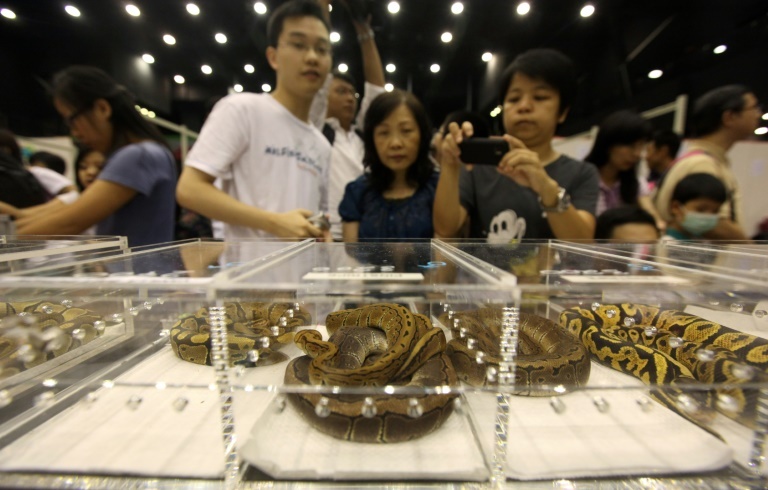 Animals such as ball pythons and tortoises are popular in the Asian pet trade because of their docile nature and low space requirements, especially in crowded metropolises such as Hong Kong and Singapore. Trade in the three reptile species from Africa to Asia rose from 8,488 creatures in 2006 to 78,295 in 2015, the study found. But the trade may be having an impact in Africa, with reports of population declines of leopard tortoises due to unsustainable harvesting, the study said. Commercial exports of wild African spurred tortoises, the world’s third-largest tortoise, have been banned since 2000, according to CITES. The study also reported nearly 100,000 grey parrots were exported between the continents over that period before the central African bird, prized for its ability to mimic human speech, was reclassified as endangered in 2016, all but outlawing the trade. The trade also raises concerns of animal cruelty in Asia, campaigners say. “The lack of adequate animal protection laws and education, especially in China, is resulting in out-of-control animal abuse,” said Jason Baker of the US-based animal rights group PETA. The report also found an increase in mammal skins shipped from Africa to Asia, especially Hong Kong and mainland China. The trade, mostly Cape fur seals hunted in Namibia, grew from 1,972 skins in 2007 to a peak of 20,651 in 2012. Namibia issues seal hunting permits each year, despite outcry from conservation groups that brand its annual cull a massacre for trade purposes. Authorities in the southern African country maintain that what they call seal harvesting is meant to control the burgeoning population which threatens the fishing industry. But activists slam these reasons as hypocritical, saying the hunts are carried out for commercial gain. The animals are harvested for their pelts, fat, which is used in beauty products, and male sexual organs believed to have aphrodisiac properties in Asia. The majority of animal skins imported from Africa to Asia are crocodile, used particularly in Japan and Singapore for luxury leather goods such as handbags, belts, shoes, wallets and briefcases, the study said.